Most people have an opinion about Starbucks, and it’s generally one of two polar opposites. Not many people sit in the middle. Starbucks have expanded rapidly over the last decade or so from a small, cultish Seattle coffee chain to a global coffee behemoth, with over 16,000 stores in forty-nine countries. The credit crunch seems to be taking it’s toll, and the giants of the market aren’t immune, especially when they sell coffee for well over £2 a cup, firmly a ‘luxury item’ therefore less important than, say, paying the mortgage. How many ‘beat the financial crisis’ type articles are out there that list taking your own lunch to work and avoiding expensive take-out coffee as a way of staying afloat? Starbucks have positioned themselves as the ‘third place’ in people’s lives, the first two being the home and the workplace. Their philosophy is that they want to create a safe and welcoming space where people can just relax and be comfortable (1). That might be fine for a little independent coffee shop, but does it really stretch across a chain of 16,000 plus outlets, all of which look the same, selling identical products? I’d suggest it probably doesn’t, which makes Starbucks latest move fascinating. Brilliant, even. Starbucks have been very successful at running coffee shops based around a comfortable and accessible theme that has it’s roots in the original, quirky independent stores the chain was born from. Their real success is in the way they’ve been able to package and commoditise their product, making the opening of a new store efficient and cost effective. The price of this efficiency is that one Starbucks looks just the same as any other. The individuality has been lost, and the presence of a ‘Community Noticeboard’ isn’t enough to convince people that they’re not in the coffee version of McDonalds. How do Starbucks break this mould when their business model is based around standardisation and efficiency? The answer is simple. They try something ‘old school’ instead, something much more in keeping with their roots. They open proper coffee shops again. 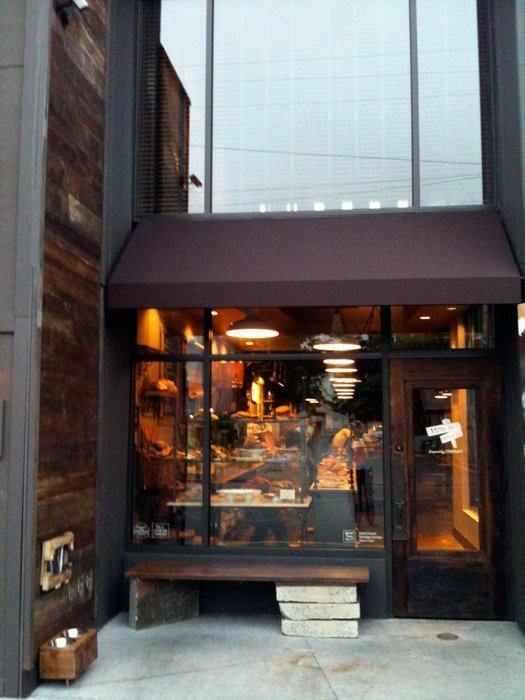 A new type of Starbucks opened in Seattle recently, without any of the Starbucks branding or styling. Simply titled 15th Avenue Coffee and Tea, the store is much more like an old fashioned coffee shop, and it aims to grow as a community hub, offering live music, poetry slams and – shock! – beer. Perhaps most tellingly, the new store has manual espresso machines. Making espresso is a real skill. It isn’t easy. The best baristas are highly trained and well practiced, and it’s clearly been impossible for Starbucks to get quality baristas into all 16,000 stores and the need to maintain reasonable standards off quality led to the inevitable conclusion of automatic machines. In the new store, a barista has to make the coffee his or herself, not simply load up a hopper with grounds and push a button, all that’s required of the machines in every other store. This is a real ‘back to the roots’ move, and a bold one. Maybe it shows that Starbucks recognises some of it’s failings, it’s homogenity. The new styling looks good. It’s individual and characterful. It has that genuine bohemian edge that the best coffee shops have. It’s got more attitude than a regular Starbucks. Maybe it’s just another marketing ploy, a way to grab back some market share as the corporation sees profit slipping through it’s fingers. Maybe it’s just the company being nostalgic. Sebastian Simsch, co-owner of Seattle Coffee Works near Pike Place Market, became frustrated last year after large groups of Starbucks employees kept crowding into his 300-square-foot store to look around. During the third group’s visit, Simsch let them know what he thought. They did not come back, even after he moved into a much larger store next door. 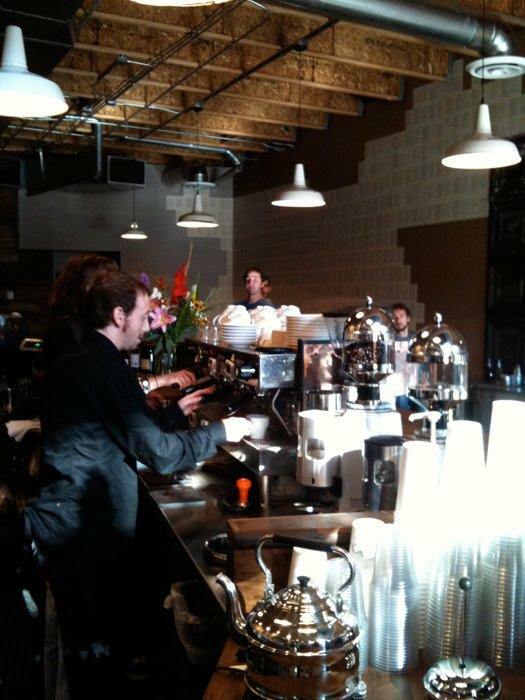 Victrola Coffee Roasters saw the Starbucks people a lot more often. Maybe they haven’t changed that much, after all. Postscript: Here’s my position on Starbucks. I’m one of those unusual people who sit in the middle. I’ve been fond of Starbucks since discovering them in Vancouver, BC in 1996. I came home thinking that it would be great to see one in Leeds, but I didn’t expect so many to eventually descend. I respect them as a pioneer, but I prefer Cafe Nero. The coffee is better, and that’s what it’s all about. Postscript #2: For really great coffee in Leeds, Opposite in the Victoria Quarter and (surprisingly) opposite the Parkinson building at the University is the place to go. Their coffee is a work of art, and by far the best I’ve ever had in Yorkshire. (1) Taylor Clark’s Starbucked: A Double Tall Tale of Caffeine, Commerce and Culture is a fascinating read and covers the ethics, philosophy, impact and direction of the chain in admirable detail. Highly readable and recommended. I would have to be on the brink of thirst death after 3, maybe 4 days in a barren dessert to drink a Starbucks. I'm on that side of the fence anyway. I like the small classic little Formica caffs which are beautiful, unique and sadly, slowly disappearing. I actually had a bit of a cry when the New Picadilly closed down http://thegraphicfoodie.blogspot.com/2009/02/new-… Yeah, you could argue that the tea was just builders tea and you wouldn't catch them making a soya skinny macha flappa cappa whatever but it was real and had soul. This is a very interesting concept they are trying. I actually really like the design but my first though was – oh my, I must be really careful now, are they being sneaky like slipping a veggie a hidden bit of chicken or something! I would be horrified to know I had handed over money into the green pocket. It is interesting that they had their peeps around the Seattle Coffee Works for inspiration but no doubt once they had taken whatever they wanted from that place, they would have no qualms about putting it out of business. I've seen those pseudo-Starbucks around town, and it's a little odd. I get it, the Big Company wearing Small Company's clothing-thing, but in an area like Seattle and its neighboring cities that are coffee-aholics, there are so many other independent, small coffee shops to go to, and there's plenty of market share to go around, amongst the Big and Small. Not that I don't go to Starbucks — we just went there for our morning java-run because we like the baristas and they know our drinks. We have favorite family-run shops, too, and we balance our coffee time between both. C'mon Starbucks, can't we all just get along?? I can't stand the taste of coffee regardless of who makes it. If a friend insists on Starbucks and drags me in there, I just get some Tazo tea instead so they don't make much money off me. However, it might be a good exercise for Starbucks to go "old school" again and go back to their roots when all their baristas were personally trained in Seattle and they had standards. I think that Starbucks usually partner up with local catering companies in the countries which they operate and so I think the quality of their food differs significantly. I found that the Starbucks in Canada, the States, Japan, and Taiwan are attractive, whereas in Hong Kong I didn't quite enjoy the items as much. I enjoy personally owned and operated coffee shops much more because I find that there is more passion in these people who run their own coffee shops. Live music is the greatest thing. Also the decoration and setting gives a nice character to these charming coffee shops not to forget giving credit to the cool baristas! Look forward to you sharing more coffee shop news! I am on the anti Starbucks camp… if Im going to spend over £2 on a coffee I much rather spend it on a coffee that has been properly made, and where all of the profit goes to the shop staff/ owner, contributing to the local economy. People that complain that Starbucks has taken over and that coffee shops have no soul need to make the effort to go and find and independent shop and then support it! Oh and your right, Opposite are amazing, these guys really really do care about their coffee, you will struggle to find a better drink than theirs in the city centre! I'm cool with any corporation; I base most of my choices off flavour and quality. I do however hate deception and this seems a little in that area. I have to say that I am one of those people who love Starbucks coffee. I grew up in a smaller town that didn't have a coffee shop where people could hang out and such. When Starbucks came into town, sometime in the late 90s, that's where we all went. Of course, they wen't overboard. Within 10 years, my same small little town has 3 mother boards and 4 in store Starbucks shops. My hometown also has more local cafes, which are now better places to go. Anyway, I went to Seattle recently, as I don't live that far away, and the small town I grew up in is in Washington. My friends and I were going to go into the original Starbucks at Pikes Market, but there really was no point. We ended up asking some locals the best place to go. So, if you're ever in the Pikes Market area, checkout the Tea and Crumpet Shop. They have amazing coffee, a wide variety of teas, crumpets, sandwiches, etc. It's a cozy-cramped atmosphere like most shops near Pikes. In downtown Vancouver, there's a spot where people say "Meet me at the two Starbucks." One shop is literally across the intersection from the other . . . God forbid someone should have to walk too far to get their watery "coffee." Quality is hit and miss with any big chain. Independent coffee shops get my buck. Curious Domestic – that intersection has an interesting story behind it. In the early days of Starbucks, the first of those branches was doing really well, turning away business, even. Howard Schultz wasn't happy about doing that, so he hatched a plan to open a second store right across the intersection, which ounds like commercial suicide, but which was actually a marketing masterstroke for sveral reasons. Firstly, the idea was so crazy that it was covered in depth by the local media, who gave it acres of free publicity. Secondly, Schultz discovered that the two stores developed completely different clientele. The new store didn't cannibalise the first, it developed it's own customer base. Each corner of the intersection had a different type of footfall and a different flow of pedestrian traffic, and Schultz realised that he could target different groups in different ways in virtually the same place. Starbucks still puts a lot of effort into selecting the right retail space, because a few feet either way can be the difference between the store succeeding or failing. interesting post – and yes, the coffee is better at Nero. Vancouver? 1997? Meet some nice Aussies? Apparantly Starbucks in Australia has sold lots of its stores. Cafe culture was just too much of the "support the local guy" there. I haven't heard of anywhere else that Starbucks has launched big time and then pulled out. And, as a "trained barista" I would say Starbucks is OK if you ask for a double tall, and I wish there was one in Fiji! Coffee here is pretty dire. I've worked for both Starbucks and Nero – the latter is the only one I'd willingly buy coffee from, Starbucks' own CEO said they they "make coffee for people who don't like coffee"
Nowadays my regular coffee stop, which I highly recommend if you're ever in York, is Le Langhe (www.lelanghe.co.uk) – best cappuccino I've ever tasted.